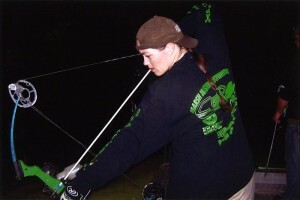 Bow fishing is one of the most thrilling and unique ways to fish there is. 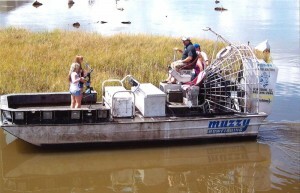 Come fish the marshes of Leeville, Louisiana located just north of Grand Isle. We leave around dark in the airboats with 3000 watts of light and cruise the marshes looking for fish. The scenery is fabulous at night, in addition to seeing fish, you get to see the estuary life. We have wildlife that you won’t get the chance to see during the day most of the time. We have on-site accommodations, and fish cleaning is included in all pricing. So for the time of your life, come down and do something the Indians did long ago. 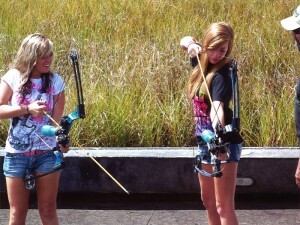 Hunt for fish with a bow and arrow, and bring home some nice fish. With the help of Capt. Darel Bryan, Capt. Dan Bryan, and Capt. Freddy Danos we manage to make even the least likely folks pretty good with a bow and arrow. Ladies, we don’t leave you out. Some of our best groups are ladies, and guys they can hammer the fish! So, for all you bowhunters, there is life after bow season. Come on down and pass a good time, book your trip today! required. Equipment and fish cleaning included. Each of our Capt. are USCG licensed and insured with over 30 years experince. 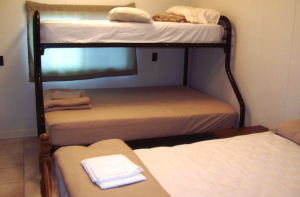 On site lodging with cable, microwave, refrigrater, and coffee pot in each room. Book your Louisiana Redfish adventure today! Click here to reserve a trip you'll never forget.